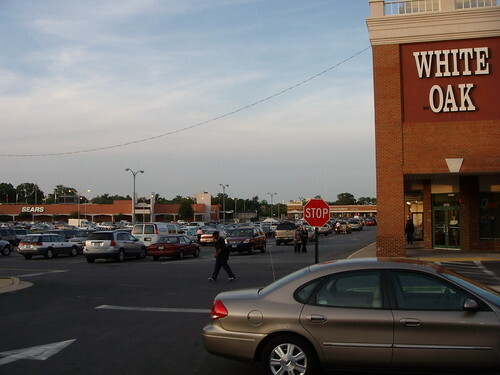 The White Oak Shopping Center. All photos by the author unless noted. 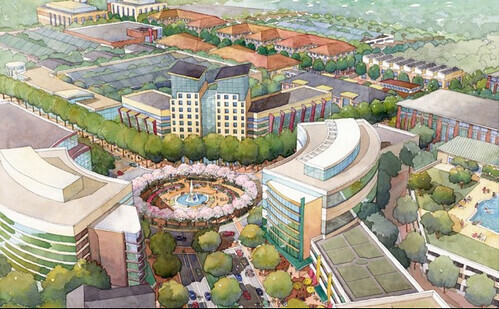 One of those places is White Oak in eastern Montgomery County, where the County Council will vote tomorrow on a plan to create a new town center. Local residents are eager to have more jobs and amenities close to home, but civic and environmental groups want to limit the amount of density in White Oak because it's several miles from a Metro station and roads are already congested. But the kind of compact, dense development proposed for White Oak could allow residents to access jobs, shops, or other amenities by walking, biking, or simply driving a shorter distance than they would otherwise. It would generate less traffic than the alternative: more of the sprawling, car-oriented development that's currently allowed in White Oak, plus additional sprawl farther out. East County has experienced little of the prosperity that more affluent parts of Montgomery County take for granted. One reason is the county's traffic tests, which prohibit development when roads reach a certain level of congestion until more roads are built. This standard led to a 20-year development moratorium in East County that ended in 2004. Development simply moved to the western, more affluent side of Montgomery County or farther out to Howard County while East County roads remained congested. Today, White Oak consists largely of aging strip malls, office parks, and industrial brownfields surrounding the Food and Drug Administration's new headquarters near New Hampshire Avenue and Route 29, which will eventually hold 9,000 workers. LifeSci Villag rendering courtesy of Percontee. Local residents say it's their turn, speaking out in favor of the plan at two public hearings. At a public forum last fall, community members called the White Oak plan their highest priority for economic development. But the Science Gateway plan would still fail the traffic tests. County Executive Ike Leggett and some councilmembers have recommended excluding Route 29 from traffic counts, arguing that it's a regional highway that would be congested no matter what. As a result, some civic associations and environmental groups around the county have criticized the plan, arguing that urban development shouldn't be allowed away from a Metro station. They say Montgomery County should follow its own rules and stick to the traffic tests. But the traffic tests can't really fix congestion if their required solution is always to build more roads, which is proven to cause more traffic. And East County residents know that they haven't solved congestion, since they have to travel longer distances for work, shopping, or other things they can't find closer to home. That's not to say that White Oak doesn't need better transportation. Councilmember George Leventhal has asked Leggett to put together a financing plan for Bus Rapid Transit within two years, so the county can figure out how to fund and build it as development moves forward. More development doesn't have to mean more driving. Montgomery County added 100,000 residents over the past decade, but the rate of driving actually stayed the same. That's because as the county grows around Metro stations, more people can get around without a car. But even in town centers away from Metro, like what's proposed at White Oak, people would have more transportation options than they do otherwise, whether that means walking, biking, taking the bus, or even driving a shorter distance. 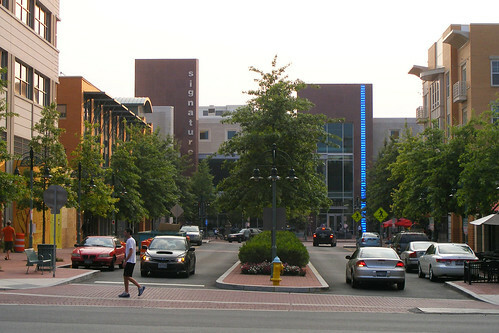 It's possible to create urban places away from Metro, like Shirlington in Arlington County. We know that people increasingly want to live in compact, walkable neighborhoods. We've seen businesses gravitate to more urban locations in the region, like Choice Hotels, which moved from an office park near White Oak to Rockville Town Center. For decades, there's been a growing divide between the east and west sides of Montgomery County. East County increasingly lags the rest of the county when it comes to new town centers like White Flint, Crown in Gaithersburg, and even Germantown. If we're going to close the east-west gap in Montgomery County, White Oak can't stay a land of office parks forever. People sure don't seem to mind moving to Howard County and commuting to White Oak to their jobs at the FDA. Obviously Metro isn't the only reason to sustain a community. 1013210Is there any guarantee for 40,000 jobs? I think not. The problem is that rather than require staging the Council is allowing Percontee to build the housing first in hopes of attracting tenants. Now, there is no question that the Hillandale and White Oak shopping centers should be allowed to redevelop with on-site residential. I don't think you are going to see any shopping areas built in the future that don't include residential. But the Life Sciences Village could just turn into another suburban sprawl, with no jobs except at the Starbucks and Safeway. In the 1950's, sociologist William Whyte did a landmark study of where major corporations leaving New York City were locating - and found that proximity to the chief executive's house was one of the biggest factors. We can still see that trend today in places like White Flint and Tysons Corner, where offices developed around the areas where high-level company officials wanted to live. Closer to home, United Therapeutics located in downtown Silver Spring it's close to the owner's house in Woodside Park. In other words, there may be some merit to doing housing first. Companies are more likely to locate in areas where they know their staff will want to live. And providing a broader range of housing types in East County (mainly higher-end apartments and townhomes, which is what LifeSci Village will have as proposed) will make the area attractive to a broader range of people, which could in turn make the area more attractive to employers. Will executives live in expensive apartments in LifeSci Village? Maybe. But they will also provide the justification for retail there (as they say, retail follows rooftops) that might attract company heads to some of the area's higher-end single-family home neighborhoods, like Quaint Acres or Springbrook. Dan, the argument that halting development to wait for more roads that would be more congested anyway from people having to drive elsewhere for amenities is the same argument I made against those opposed to the Riverdale Park Cafritz project. They fail to realize that they cause more traffic having to drive 5 miles to a quality grocer store than if they had to just go around the corner to one. The closer you are to quality amenities, the less trips you have to make which improves your quality of life. We need to stop car counting and start distance counting. How far would you have to travel in traffic to get what you need? A lot more people would be okay with 5 minutes in congestion than 35 minutes. While I'm thrilled for the folks in White Oak, I do wonder about competition within the Eastern portion of the county. There's only so much demand to go around. What happened to the Glenmont push? What about Four Corners? There's a lot more room to develop (or redevelop) in White Oak than there are in other parts of East County which are more built out, like Four Corners or Forest Glen. Wheaton and Glenmont have more space, but there's already a commercial/industrial presence in White Oak (FDA notwithstanding). 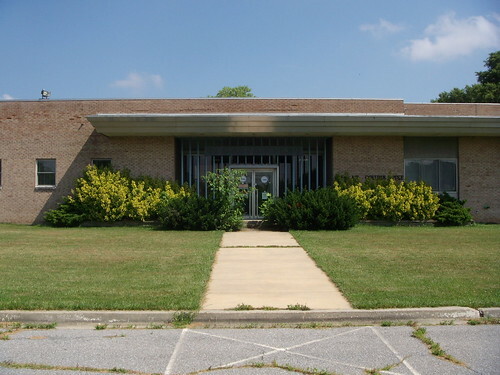 Woody correctly notes that the office market is kind of weak in Montgomery County, though as we know from the county's attempt to lure office tenants to Wheaton, they may be more interested in White Oak because of what's already there. In other words, White Oak may not necessarily take business away from other parts of East County, but rather offer things that those areas can't (and vice versa). Dan, very insightful as always. I'm interested in the argument that local jobs in new urban-like redevelopments away from transit can minimize the amount of increased traffic expected in nearby communities. I understand the theory and wonder whether there's data from other communities that have done something like this to support it.